When you attend a Molson Canadian Live Summer Concert Series event at The Cellar between now and September 1st, 2013 you will be entered to win a grand prize of a trip for two to Ontario’s Cottage Country for the Molson Live @ The Lake concert event in September. Attendees at The Cellar specifically between now and August 7th also have the chance to win tickets to Squamish Valley Music Festival, which is coming up August 9th and 10th. 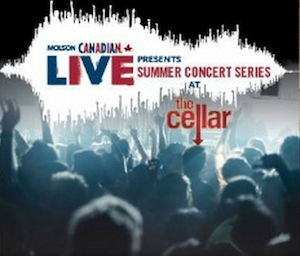 Tickets for the Summer Concert Series at The Cellar are available online in advance for $10. Doors open at 7:00pm on showcase nights. I will draw one winner at random from all entries at 12:00pm on Wednesday, August 7th, 2013. Must be 19+. Please enjoy responsibly. Follow The Cellar on Facebook and Twitter for more special event info. Dear Rouge is the bomb!